Five quick, top-of-mind reasons to consider telecommuting: (1) your workforce expands beyond available space infrastructure; (2) to enable customer/technical support employees to tap into customer files; (3) managers want 24/7 access to financial and performance data; (4) traveling employees need linkage to company resources; (4) “flex time” options would improve staff recruitment and retention; and (5) ultimately, telecommuting options can lower operating expenses, improving profitability. If it were just a matter of accessing email or checking a file or two, you’d equip everyone with a smart phone and an hour’s training in cloud file retrieval. But if your business professionals, like mine, need to be able to actually reach past your firewalls and tap into the business in real time to maintain a competitive advantage, what’s involved? And, just as importantly, who might be involved in the decision process? • You’ll need an internal audit of existing software and licenses, and an understanding of shared license rights (onsite and offsite permissions versus double user registration expense). • Cloud-based versions exist of many of the common-place programs you likely rely on most, and there are a growing number of shared-network and email options — would it make financial sense now, while considering telecommunications options, to move the entire company to a cloud-based platform for Microsoft Office programs, Quickbooks, etc? • Is it preferable to provide company-issued, preconfigured computers – or, to minimize capital expense – – to reload an employee’s existing home computers with new VPN and application software? • Can the company manage a one-size-fits-all program? Can it support customized solutions? Does your staff share your vision of what is to be accomplished, your mind map of what a telecommunications program would entail? • Participation requirements: Establish who can have remote access, and the enrollment procedures. • Connectivity options: Do you need smart phones, electronic tablets, iPads, laptops, cloud linkages to files, wireless printers? -Who defines what software is used, or how, on company equipment? Can the employee add favorite software or aps to an iPhone or iPad for personal use? 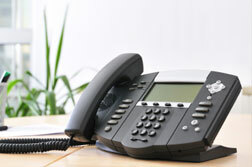 -Home office setup: will/can you provide a written guide and/or technical setup assistance? • Expenses: Clearly define company or pre-approved reimbursements in an agreement signed by the employee. -Who pays for Wi-Fi or Internet access? -Home office supplies: who pays for toner cartridges, copy paper, etc.? What do you expect from the employee, and what company cultural shifts need to occur? • “Check-in” progress reports, decentralized meetings, accounting and expense submission/reimbursement, etc. After you have your expectations and policy in place, plug into expert assistance for great advice and technical support. Here are some tips from our friends at TDS to help frame, and even answer, some of those checklist questions! Thanks for joining me this week, and don’t forget to check in again next week, when we’ll talk about how (or why) to create a company Facebook contest.